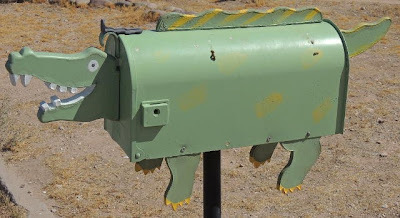 As I rode my bike around Tucson's (mostly) side streets back in 2012, looking for art on the walls of homes and businesses, I kept spotting creative mailboxes along the street. I started to think about posting some mural art along with a special mailbox. But (of course) a mailbox isn't even close to flat! That gave me the idea for the blog you're seeing here: Tucson Mailbox Art. It didn't take long to hunt through the photos I'd taken of mailboxes in the past year or two and start this blog. The first entry, dated 12/12/12, showed a mailbox I'd snapped two days before. This “croc box” was hand-painted. As the homeowner told me that day, it came to Tucson from Florida.